The reading of this title might make you think ‘right, as if my choice of sportswear will affect my performance’. In this article I’ll explain why in fact it is important to invest in good quality underwear. Different sports require different attire and it also matters whether or not you’re male or female. That brings me to the subject I’ll discuss in this article; the sports-bra. Should you really wear a sports bra during your workout? The answer is yes, you really should. Your breasts consist of fat, connective tissue, fluid and glands but no muscles. You cannot train your breasts because they contain no muscles. This means during active movement there are no muscles that can support the movement of your breasts. For this reason, many women who play sports are inconvenienced and for some it may be even a reason to quit certain sports altogether. The truth is, active sports are not good for your breasts. A chest, which on average weighs between 200 and 300 grams, does not agree with all the bouncing movements some sports require. It puts great pressure on the tissue of the breast and the skin structures, which can lead to damage. In the long run, the skin can stretch through and make the breasts sag. A regular bra simply does not provide enough support. 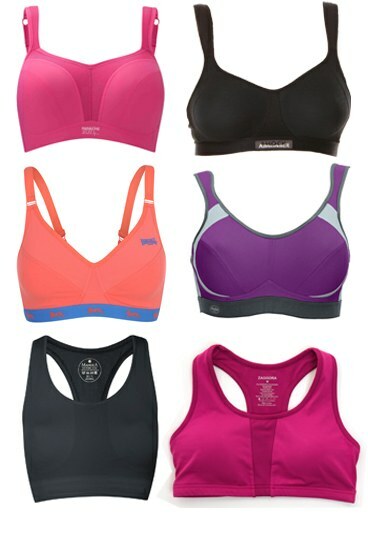 All kinds of sports bras are currently available for women in all shapes and sizes. Moreover the sports bra ‘technique’ is constantly improving. In certain sports bras, your breasts can move up to 78% less depends with regular bras. Ouch, think about the jumping jacks you did while wearing a regular bra! tight enough so that it doesn’t shift. * The bra straps should be soft and wide so they won’t cut in your skin. Choose a bra that has a breathing fabric such as cotton or any dri-fit that can absorb transpiration. The bra all over should be at the same height and should not ‘ride up’ at the back. When you are fitting the bra do a jumping jack, move around and see if the support is sufficient for your activity level. Raise your arms above your head to make sure the elastic bottom edge does not move upwards. If it does, then you need a smaller size. It is always a good idea to step into a store and get assistance rather than buying a bra online. So, you can be as active as you like. Do up to a thousand jumping jacks without damaging your breasts if you choose the right sports-bra! It is not only essential to purchase a good sports bra to protect your breasts, but also to ensure your comfort when you are highly active.